The reason for mentioning him is that he had correctly worked out that the earnings charade was Wall Street's tried and tested method for suckering in the bagholders to buy stock at the top of the market—and what have we been hearing from the mainstream financial media for weeks and months now?—that right, how great earnings are going to be, so you should be fully invested now. They don't talk much about how rising rates are going to crash the market: they do that once it's on its way down and they've dumped all their holdings onto the mugs, and then we'll be treated to plenty of after the event analysis. Granville did an extensive study of the trend of earnings relative to stock market cycles and overlaid it onto the main stock indices, and found that that stock markets topped out about 9 months ahead of earnings, and were well into bear markets by the time that earnings peaked. What this means is that you can forget all the lofty and inspiring talk about earnings continuing to improve, and instead look at the trend of the market and of interest rates. We know already that interest rates are rising and have been for some time now, and that they are to the market what the rising sun is to Count Dracula, and we will see on our charts now how large topping patterns are already approaching completion on the major indices, as Smart Money uses the positive earnings story as cover to offload their holdings to the dummies. We'll start with the Dow Jones Industrials where we see a fine topping Triangle rapidly approaching completion. The reason that the market did not plunge straight down from its January parabolic blow-off top in January and stopped at the support shown and bounced around above it is that these processes take time—you do not stop a heavy freight train travelling at speed and get it going at the same speed in the opposite direction in an instant—it takes time to kill the momentum in one direction and get it moving in the other. The bearish Descending triangle that has formed is the manifestation of this process, a process that involves the transfer of stock from strong to weak hands, who are sometimes known, perhaps somewhat uncharitably, as dummies, mugs or suckers. The mainstream financial media conspire with Wall Street to drain the lifeblood out of these people. These are your Mom and Pop investors, people who foolishly entrust their Pension money to "experts," etc., only to end up bagging groceries at Walmart in their 60s. The financial media have been going at it gangbusters in recent weeks, trying to keep the retail investor all in. The 1-year chart for the S&P500 index is very similar to that for the Dow Jones Industrials and doesn’t require further discussion. 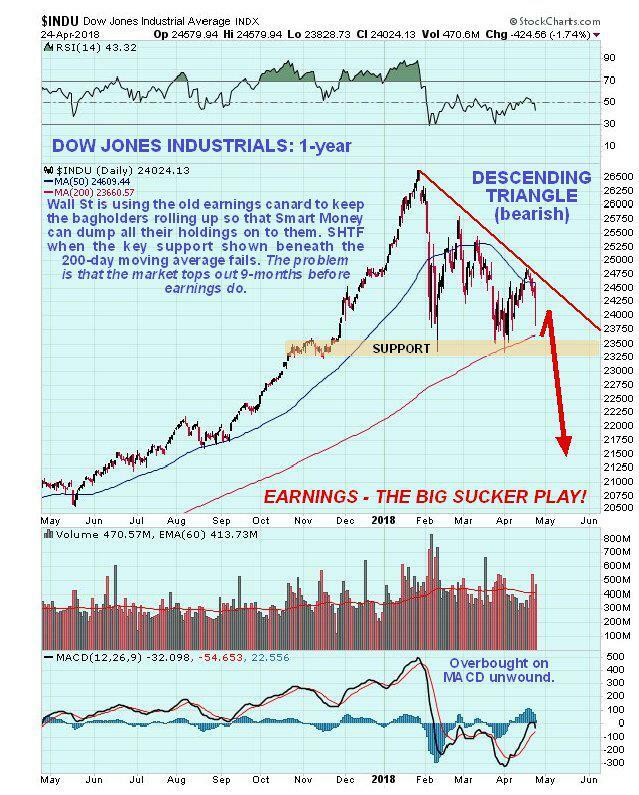 The key point to note with both the Dow Jones Industrials and the S&P 500 index is that they are still in their topping patterns, but by the look of it, won't be for much longer. 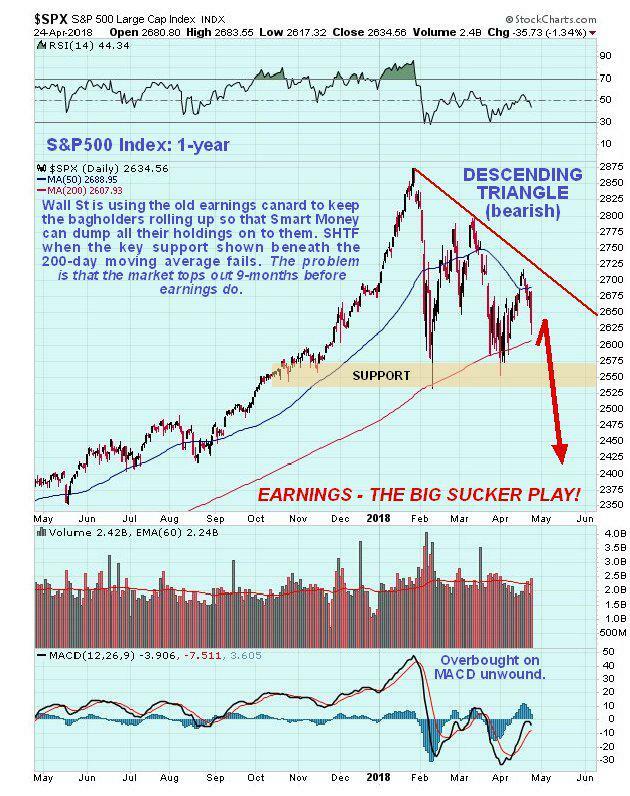 When the key support shown just below the 200-day moving average fails, it's SHTF time—once this support fails we could see a brutal crash—what happened in January-February was just a warm up, and a likely cause will be the failure of the bond market causing interest rates to spike. We will, of course, be looking at ways to profit from the collapse shortly on the site, such as bear ETFs and shorting the FANGs, etc., as well as considering the impact on the precious metals sector etc.